Based in Ohio, Cary Louis is an experienced nutritionist with a knack for writing clear concise content. She has been published in "Nibbles for Health" and holds a Bachelor of Science in human nutrition from Kent State University. 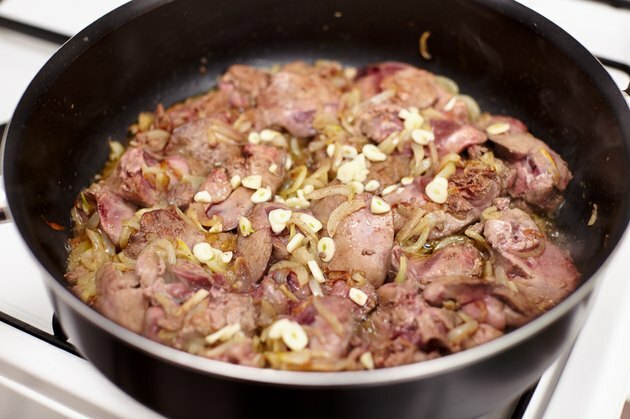 Liver makes an excellent meal when placed over a delicate bed of onions, but sometimes you simply don’t have time to defrost the meat before preparing it. Although pan defrosting your liver will reduce the tenderness somewhat, you will still end up with tender meat if you do it properly. With a basic set of cooking supplies, prepare frozen liver in less than an hour of cooking time with the preparation included. Place the frozen liver into a large frying pan and place a lid over top of it. Heat the liver for 20 minutes over low heat, flipping the meat every five minutes. Slice off a ½-inch layer from the part of the liver that was just touching the pan each time you flip the liver. This will help the liver defrost all the way through without overcooking sections. Place each of the removed layers onto a plate. Make small slits around the membrane of the liver sections to prevent the meat from curling as it cooks. Place the slices on paper towels to dry and season them liberally with salt and pepper. Place a cup of flour into a wide dish and coat the slices with flour. Pat the slices to remove excess flour. Add 2 tbsp. of olive oil to your frying pan and heat the oil over high heat. Add the first slice of liver when the oil begins to smoke. Add the second slice 30 seconds later and continue adding another slice every 30 seconds until they are all in the pan. Saute each of the slices for five minutes on the first side and flip them over to sauté them for an additional three minutes on the other side. Serve the liver with the well-browned side up.